Kenney Mencher: Painterly Realism: Constructing a painting from your photographs. Painterly Realism: Constructing a painting from your photographs. Kenney Mencher www.kenney-mencher.com If you are a realist artist and you use photographs as the main form of reference material for your paintings, you are in good company. Just to name a few artists who are known for this: Gustave Caillebotte, Edgar Degas, and more recently Eric Fischl, Gerhard Richter and Chuck Close. Most recently, John Currin, who recently had a major retrospective at the Whitney, buys stock photographs and bases his paintings on them. These artists, like myself, are not photorealists but rather artists who use photography, an important distinction. With the advent of digital technology the creation, printing and use of photo based reference images has never been easier. Almost all of my paintings are based on some sort of photographic reference material. In the past, I used snapshots, film stills, and photos from magazines and newspapers. More recently, I found that these images didn’t work for many ideas I have for paintings. I felt constrained by preexisting sources and wanted a more comprehensive, copyright free source for my images and so I’ve begun to generate a collection of images that I’ve taken of my friends of myself. Since I use a digital camera I don't need to worry about the cost of shooting off hundreds of photo because I only pint out the ones that I like. Often I get a general idea for a painting. This one started out partly in reaction to my being dropped by a gallery that was selling quite a lot of my work. The women who worked in the gallery were uncomfortable with the content of my work. The gallery director described the work as rather "wry and perverted." The idea of a male point of view as being "perverted" took hold of me and in a way I thought that the perceieved point of view of my work was that of a "peeping Tom." I asked my wife to photograph me peaking around doorways. I coupled my “peeping Tom” image with the ideas above and this painting “Camera” was born. 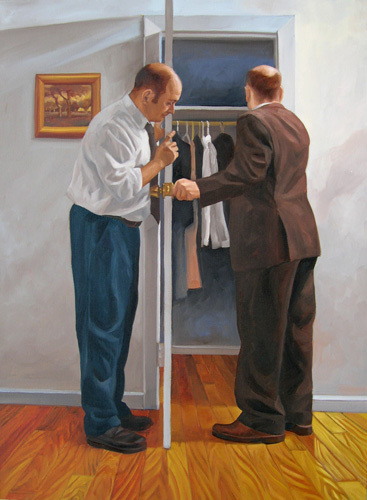 Another idea I had was to build some paintings around the idea of closets. Remembering images from books and film, dealing with clichés such as “skeleton in the closet” and “monster in the closet,” became a bit of an obsession for me. Here I asked my wife to shoot a series of images of me peering into closets. The result was this painting called “Closet.” However, since these paintings are made of multiple images, shot at different times, the construction and combining of these images to make a pleasing and coherent composition is sometimes a bit complicated and whenever we shoot photographs such as these we make sure we shoot them from consistent points of view. Often we'll take several shots from different points of view just to make sure we have it right. Some paintings just grow out of looking through my folders of digital images and seeing what images might work well together in a painting. Even though the points of view for these two images are slightly of since, I decided that it might still be possible to make a cohesive composition through some adjustments in my drawing. I start making a painting like this by printing the images out that seem to work together. Using Adobe Photoshop I will often enhance the middle range of values and enlarge sections of the images, such as faces and complex drapery, so that I will have detailed images to work from. I then make a series of thumbnail sketches. I try out different compositions knowing that I still may make radical changes even after I sketch my idea out in vine charcoal on canvas or panel. I keep a broad range of prepared surfaces in different sizes and proportions in my studio so I know that whatever composition I decide on I’ll be able to work on it immediately. The painting I made for this demo is a great example of this. I start my paintings by wetting the canvas with a spray bottle of water and then toning the canvas with a rag and burnt umber acrylic paint. Sargent and other painters such as Rubens began with a toned canvas, so I’m not one to argue. The toned canvas gives me a neutral tone and allows me to start thinking about the value structure right away. This takes about a half hour to dry if I set a fan up on it. After this dries, I begin on the drawing. I keep a music stand with my reference material to the left of my easel and an old rolling tool cart with a board and glass sheets on top as my palette. I used to try to paint “ala prima” or wet into wet without any under drawing just like Caravaggio, but in the last couple of years, I realized that I’m not Caravaggio. I also realized that I needed to work on my drawing a bit more and this would free me from worrying about it when I was painting. I found the perfect method. Andrew Wyeth, in “Three Generations of Wyeths” describes how his father N.C. Wyeth started with a complete drawing in vine charcoal underneath his painting. This charcoal was allowed to lift up into the paint and provide some value in his paint. The great thing about drawing with vine charcoal on the canvas is that when I make a mistake or need fix something all I have to do is rub it out. When I was setting up “Hat in Hand,” I rubbed out parts of the figure’s faces and bodies and redrew them until they were right. I also used a yardstick and a T square to draw most of the lines. This drawing takes about a day of work for me. Sometimes I can start on the painting but usually I like to let the drawing sit and work on another drawing so that I can live with it and come back to check out the problems. Sometimes I’ll let a drawing sit on a canvas for a week or two and come back and revise it some more before I paint. In this case, even though I had reproduced my thumbnail’s initial idea and even drew it out on the canvas, after I stepped back from the drawing I felt that the composition was weak. It seemed too spread out and the environment was not interesting enough for me. I took the image of the easel, and started again on a smaller square panel. I like the composition of this one much more. I know that all my teachers and the books say that I should work the whole painting at the same time but I find that it works better for me if I attack the heads and hands in the paintings first. If they work out then I become invested in finishing the entire painting. Sometimes, as in this painting I will work the majority of flesh tones, drapery, and immediate environment first and then move to the next figure later. After revising my drawing a bit more I start by mixing up big gobs of flesh tones on my glass sheets with plastering knives. For my flesh tone, the base is a mix of cadmium orange, blue, burnt sienna, and white. I use this as a base and add more white as I move into the midrange and yellow as I move into some of the highlights. For the lightest highlights, I sometimes use a cool white mixed from burnt umber and white. These three tones will be used as a base in which I will also mix other colors later, such as the cadmium red pinks in the nose, cheeks and ears as well purples, ochres and umbers to get cool and warm effects in shadows and highlights. You can see that the paint on the palette is arranged in a medium dark to light value scale. I start by painting with a large brush (usually one or two inches). To begin I start with a mixture of galkyd medium and burnt sienna. Some of the vine charcoal mixes in with the orange brown of the burnt sienna and creates some cool browns in the underpainting. I wash in the biggest dark medium values and then while the paint is still wet, I start applying the already mixed medium value flesh tones with a synthetic sable. I go to the lights next by mixing some whites and some cadmium reds into the main body color on the palette. I start applying these to lighter areas. Next comes some blending and the reapplication of some darks. During this phase I alternated between synthetic brushes and natural sable. Next, I go back to the darks by adding in more burnt sienna to the darker mixes some burnt sienna and or dioxanine purple into the medium darks. For the darkest darks, I added burnt umber to that mix or I mix a separate batch of burnt sienna and purple. The rest of the process is a series of push and pull types of corrections until the values and colors seem right. I use the same formulas and working method for the hands. The clothing is the next step and usually premix the colors before hand so that I mix less on the canvas and the effects are more deliberate. For example, for the hat I used burnt umber and white for the darker areas. This is a cooler beige in the shadows. For the middle tones I used burnt sienna, burnt umber and white and for the lightest areas I used white and a burnt umber. The jacket was a bit easier and I used straight out of the tube burnt umber for the darks and burnt sienna for the mid tones. For the lights of the jacket I mixed burnt sienna and yellow ochre. For the next figure you can see I repeated the same formulas and flesh tones I had already mixed for the first figure. I kept the colors fresh overnight by covering them with plastic wrap. The nexts step was to start on a neutral toned dark background. This is a combination of burnt umber, burnt sienna and white. I picked up some the background color and used some of it in the flesh tones of both figures. I also started work on the shirt with a wash of burnt ochre. The middle tones of the shirt are a combination of white and payne's gray. The lights of the shirt are yellow ochre and white. The bowtie uses the same colors as the jacket but is kept in the darker range of values. I use some of the burnt umber mixed with galkyd for the darks of the shirt. The shirt of the second figure was painted in the same manner. After working out both figures to some extend I move back and forth over entire areas of the painting. Sometimes I will grab some of the color from the background or drapery and put it into some areas of the faces hands and hair. to payne's grey, white and yellow ochre. The hat was a similar transition of burnt umber in the darkest areas mixed with with white and burnt sienna for the middle tones. In the lightest areas the proportions changed slightly to favor the warm tones of the burnt sienna. For the wall in the background I alternated mixtures of white and raw umber with gray and white to give a warm/cool modulations. For the lightest sections I used a combination of burnt umber, white and yellow ochre. The finished product at right. I think that a lot of artists feel that working from life is the best way to make a painting. I would love to be able to paint consistently from a model but many of my ideas are almost unworkable because I cannot afford a model and I like to work with multiple figures to create a richer narrative in my painting. Having worked from life in the past I base many of my color decisions and value scale on what I remember rather than what information the photgraph describes. Sometimes I will print these images out in black and white so the artificial photographic color doesn't distract me and I can focus more on the tonalities and chiaroscuro of the image. If you liked this article check out my blog that has a step by step progression of some new paintings. Come up with a thesis and then support it! ARTSPAN news! Call for entries. Malcom Liepke a really fantastic artist!